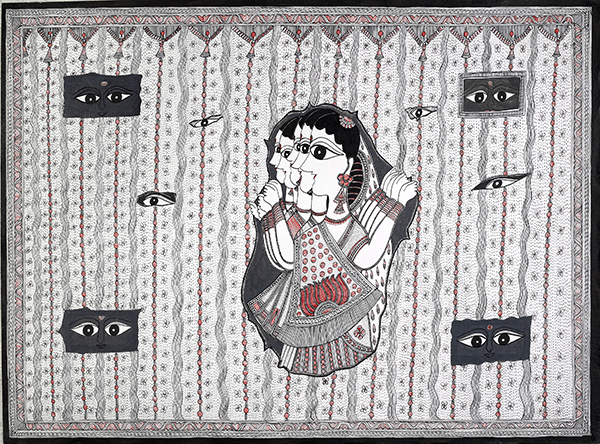 The commodification of South Asia folk art, including Mithila paintings by women from Northern India and parts of Nepal, is the focus of an upcoming Ray Smith Symposium. The symposium “Transformations in South Asian Folk Arts, Aesthetics, and Commodities” will run Feb. 27 to March 1 at various locations on the SU campus. More than a dozen artists and scholars from Canada, India, the United Kingdom and the United States will participate in keynote lectures, panel discussions, workshops and exhibitions. All events are free and open to the public. For more information, call 315-443-2533 or visit mithila.syr.edu. “Transformations” is presented by the South Asia Center in the Maxwell School’s Moynihan Institute for Global Affairs, in conjunction with The College of Arts and Sciences and the Cornell-Syracuse South Asia Consortium. “The goal of the symposium is to unpack questions about identity, the pressures of global consumerism and transnationalism, and the troublesome divide between arts and crafts in South Asia,” says Susan S. Wadley, the Ford-Maxwell Professor of South Asian Studies in the Maxwell School. Wadley also serves as co-director of the South Asia Center with Tula Goenka, associate professor of television-radio-film in the Newhouse School. Wadley and Goenka—along with Romita Ray, associate professor of art history in arts and sciences—have organized the symposium. “Transformations” also offers related academic courses and a nine-day residency by master painter and teacher Rani Jha. Ray says the symposium is timely because of the growing commodification of South Asian folk art. She attributes this shift to intermediaries, which influence the buying habits of art retailers and collectors, and to technology, which is changing the way art is made and reproduced. • Peter Zirnis, curator and photographer of Mithila art and an EAF board member. Organizers are particularly excited about Jha, who will conduct several painting demonstrations and workshops at SU and in area schools, as well as teacher training sessions at Onondaga-Cortland-Madison BOCES. A feminist from rural India, she uses painting to raise awareness of social justice issues for Indian women. For more information about Jha’s residency, call 315-443-2553. Long the domain of upper-caste women, Mithila artwork is known for its vibrant color and geometrical shapes. Such paintings originally consisted of murals, which adorned the inner walls of homes and courtyards and depicted mostly gods and goddesses, deity symbols and daily life. When Mithila painting was introduced to the outside world in the 1930s, it underwent a rapid transformation in terms of commodification, style and content. “Today, women of all ages use Mithila painting to comment on issues ranging from arranged marriages, to dowry deaths, to female infanticide. But it’s also used to celebrate female goals and accomplishments,” says Wadley, citing a famous painting that envisions Indian and Pakistani women playing cricket together, something that would have been unheard of 40 years ago. “Transformations” is underwritten by a Title VI grant from the U.S. Department of Education’s National Resource Center. Additional SU sponsors are the Special Collections Research Center; the Renée Crown University Honors Program; the departments of Anthropology and Religion; Susan S. Wadley, the Ford-Maxwell Professor of South Asian Studies; and the Friends of Swami Agehananda Bharati. “Transformations” is part of the Ray Smith Symposium Series, established in 1989, as the result of a bequest from the estate of SU alumnus Ray W. Smith ’21 to support humanities programming in The College of Arts and Sciences. For symposium updates, follow the South Asia Center on Facebook and Twitter.